Actress Bipasha Basu‘s sister Vijayeta Basu got married in a Bengali wedding ceremony on February 26, Tuesday. 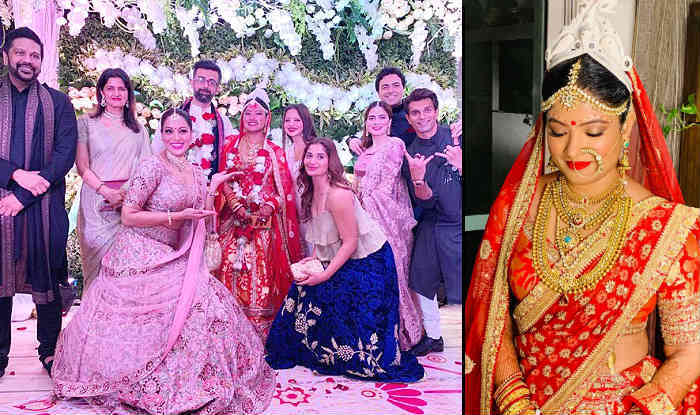 The actress’ younger sister got hitched to her longtime beau Karan Talreja in a simple court wedding earlier in the day and then a beautiful big wedding later. Vijayeta looked stunning as a Bengali bride as she dressed up much like how her sister, Bipasha styled herself at her wedding with Karan Singh Grover in 2016. For the special day, Bipasha donned an embellished lehenga by designer Dolly J. Her pink lehenga was styled with sleek statement jewellery that included a pair of diamond studs, Kundan neckpiece and a big Maang-tika. Bipasha had white flowers in her hair as she tied them in a neat bun. Karan wore a blue-white traditional outfit. Earlier, Bipasha shared a few photos of Vijayeta getting dressed up for her court marriage in a simple bright pink saree wearing the traditional white Bengali head-gear meant to be worn by the brides. On the work front, both Karan and Bipasha have been away from the movie business for a long time now. However, the actor is reportedly set for his next film titled Aadat while Bipasha hasn’t announced any new project on her part. Meanwhile, everything about the wedding seemed so beautiful. Cheers to the ‘puppy love’ and to the lovely Basu family! Our congratulations to the newlyweds.